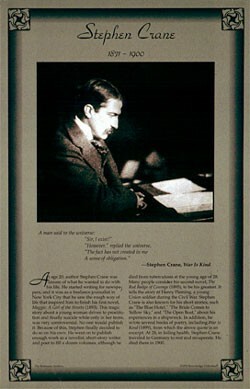 This unique educational poster features a photo of the great 19th century American writer Stephen Crane, as well as a quote from "War Is Kind," and concise biographical text summarizing his life and career. In his short life, Crane produced enough work to fill a dozen volumes. But he is best remembered for his second novel, "The Red Badge of Courage," which tells the story of a young Union soldier during the Civil War. Sadly, he died at age 28. 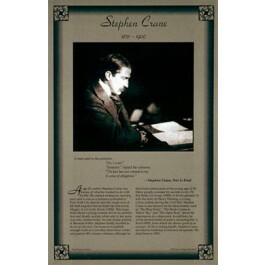 This poster is a great way to introduce students to this classic 19th century American writer.